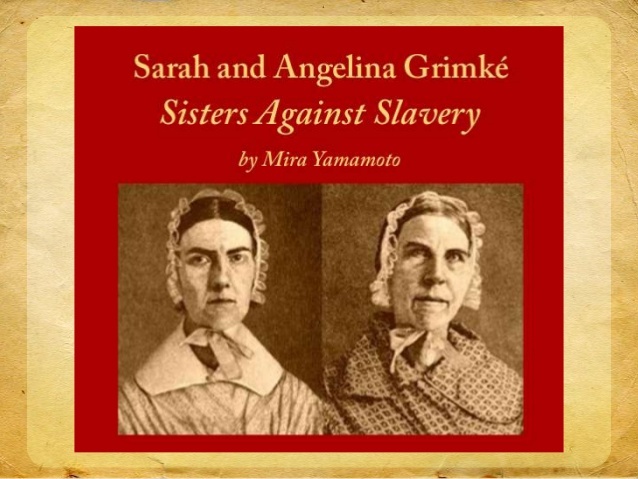 Angelina Grimke and her sister Sarah Grimke were legends in their own lifetimes. Together these South Carolina sisters made history: daring to speak before “promiscuous” or mixed crowds of men and women, publishing some of the most powerful anti-slavery tracts of the antebellum era, and stretching the boundaries of women’s public role as the first women to testify before a state legislature on the question of African American rights. Their crusade, which was not only to free the enslaved but to end racial discrimination throughout the United States, made them more radical than many of the reformers who advocated an end to slavery but who could not envision true social and political equality for the freedmen and women. And the Grimke sisters were among the first abolitionists to recognize the importance of women’s rights and to speak and write about the cause of female equality. What made Angelina and her sister Sarah unique within abolitionist circles was neither their oratorical and literary talents nor their energetic commitment to the causes of racial and gender equality. What made them exceptional was their first-hand experience with the institution of slavery and with its daily horrors and injustices. Abolitionists like William Lloyd Garrison, the editor of the Liberator, and Theodore Weld, who Angelina married in 1838, could give stirring speeches about the need to abolish slavery, but they could not testify to its impact on African Americans or on their masters from personal knowledge. Angelina Grimke was born in 1805, the youngest of fourteen children born to John Grimke and Mary Smith Grimke. As the daughter of one of Charleston’s leading judges, she could look forward to a life of luxury and ease, her comfort assured by the presence of slaves trained to respond to her wishes. As an eligible young woman, she could have enjoyed the lively social life of Charleston’s planter society with its balls and dinner parties that would have led eventually to a good marriage and an elegant home of her own. But Angelina Grimke chose a different path: Like her older sister, Sarah, she left the South and devoted her life to racial and gender equality. In the early nineteenth century, the causes that the Grimke sisters espoused placed them among the most radical Americans of their day.